It’s really, really hard to find a good Microsoft Windows device for under £500. There are some diamonds in the rough — devices that sacrifice display quality or form or speed to get the price way down. Yet until today there was no clear winner. Microsoft’s new Surface Go could change that. The new 10-inch Windows tablet looks just like the pricey Surface Pro we adore. Only smaller, and starting at just $400. There's no UK prices just yet, but it'll likely be somewhere around £350-£400. The finish Microsoft is giving this device is what really makes it appealing. Think an Apple 9.7-inch iPad (which is absolutely one of this device’s main competitors) or an actual Surface Pro. Its 1,800 x 1,200 resolution display has a 217 PPI and a nice wide viewing angle, so it never looks as cheap as its price tag suggests. And there’s USB-C! This is the first Surface tablet from Microsoft to have USB-C, and it is about damn time. The Surface Go will charge via the port (provided your power brick is big enough), but it won’t support Thunderbolt 3. And if you want to use one of Microsoft’s pricey docks, or charge the way Microsoft intended, you’ll have to use the traditional Surface power port, which Microsoft continues to cram in its mobile Surface products. Another thing Microsoft has crammed in is far more welcome. The Surface Go is using the same hinge Microsoft introduced with the Surface Pro. What that means is you should have a device with the sturdiest 2-in-1 hinge in the game. The sample I played with stayed securely in every position I stuck it in. There was no floppiness. The immediately luxurious look of the thing and that appealing hinge almost distracted me from the specs. Those specs are far less appealing than the price: just 64GB of storage, 4GB of RAM, and a wimpy Pentium 4415Y processor. That’s pretty average for the price point, and generally means a machine that is deeply slow and frustrating to use. Yet Microsoft is insisting its worked hand in hand with Intel to optimise software for the CPU. Specifically its been optimised to work better with Windows and Microsoft Office. I obviously haven’t had time to benchmark the Surface Go, but PowerPoint wasn’t as noticeably sluggish as I’ve come to expect from this CPU. Instead it seemed responsive — speedy even. But Office is just a handful of programs. If Microsoft’s speed claims bear out, it might make the Surface Go a fantastic option for students on a budget, but it wouldn’t necessarily help the people who need Photoshop, or even a card game like Gwent. Microsoft is offering additional configurations, which increase the RAM and storage, but stick with the CPU. Microsoft reps told us it steered clear of the Core i series to help preserve battery life. Microsoft claims it gets over 9 hours. Adding more RAM and storage will increase the cost of the Surface, as will the keyboard cover, which retails for $100 if you want a plastic cover, and $130 if you’d prefer Alcantara. 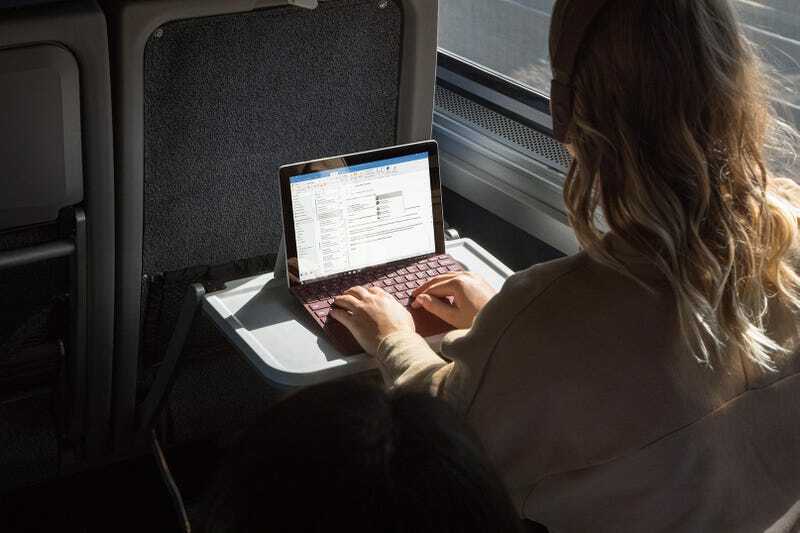 As that cover is vital to using the Surface Go as a laptop, it means, realistically the price is $500 to $530 – not $400. That puts it in the same price range as the Samsung Chromebook Pro — our current favourite cheap laptop. That Chromebook has a bigger display, and it’s also an actual laptop and not a tablet. But it runs Chrome OS and is heavier than the Surface Go, which weighs just 1.15 pounds. This is also intended to compete with with £320 9.7-inch iPad. That device, which Apple is marketing heavily as an education device this year, also requires you spend money on a keyboard. Only instead of an elegant one that snaps into place and simply works, the iPad needs a Bluetooth keyboard, and the solutions currently available aren’t nearly as sleek or elegant as Microsoft’s solution. 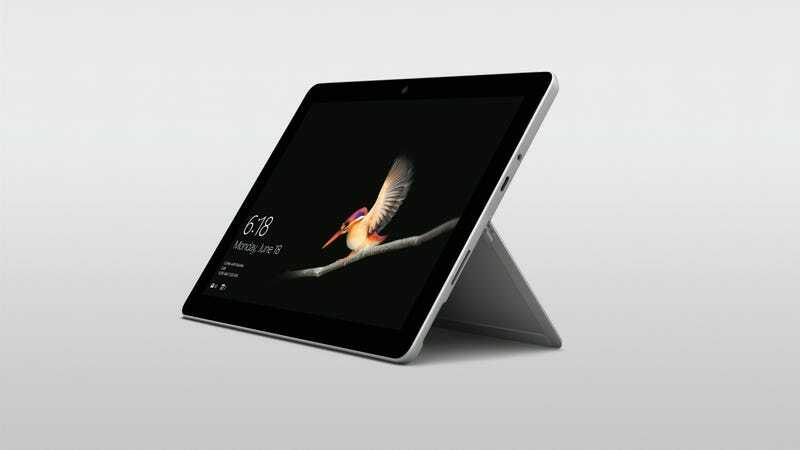 So even though the iPad might cost less, it won’t necessarily give you the same laptop like experience Microsoft’s tiny Surface aspires to. And aspires is the key word. While my initial reaction is “when can I buy one” I’ve only spent a little time with it. There’s some definitely yellow flags that suggest it couldn’t be as slick as Microsoft wants us to believe. The nine hours of battery life (Apple promises 10), cost creep from the keyboard, and that Pentium processor are absolute cause to be wary of this as the next device for the family to share or your kid to take to college. But none of us should have to wait too long to have a better understanding of if this is the budget Surface we’ve wanted or a too slow dud. 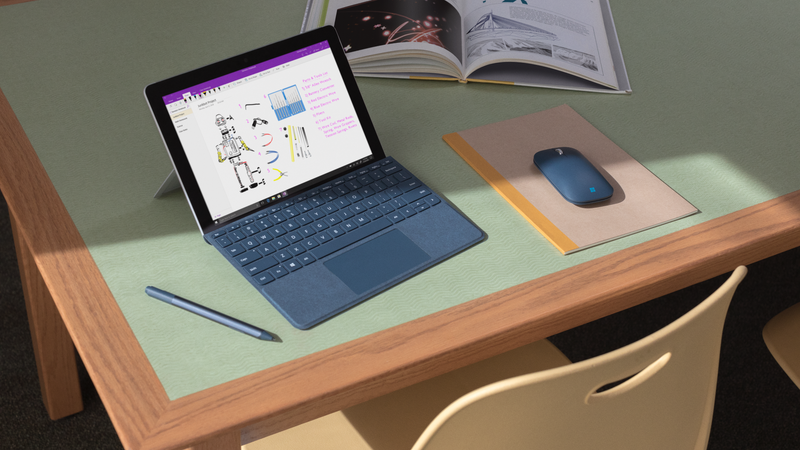 The Surface Go is on sale July 10th and ships in August.